Newsweek ranked schools on how well they prepare their students for college, taking students’ socioeconomic backgrounds into account. Newsweek sought to recognize schools that are closing achievement gaps by performing better than statistically expected for their level of poverty. About half of the students at CAMS qualify for subsidized meals based upon family income. “Our rankings aim to identify the public high schools in the U.S. that do the best job of preparing students for college and overcome the obstacles posed by socioeconomic inequality,” Newsweek stated. CAMS also made Newsweek’s “absolute” ranking of high schools regardless of student demographics, earning 186th place out of the 500 schools that made that highly selective list. Newsweek ranked the schools by creating a College Readiness Score using data on graduation rates, Advanced Placement or International Baccalaureate college prep exams, SAT and ACT exams, counselor-to-student ratio and other factors. CAMS earned a college readiness score of 99.73, placing the school in the top 1 percent of the 500 schools appearing on the “beating the odds” list. Located on the Cal State Dominguez Hills campus, CAMS is accustomed to national recognition. Last year’s ranking of America’s Best High Schools by Newsweek reported that CAMS?achieved the top SAT scores in the state, and the fourth highest SAT scores in the nation. CAMS has repeatedly earned both the California Distinguished School Award and the National Blue Ribbon Award. 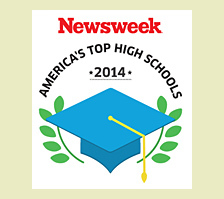 U.S. News and World Report and The Washington Post also have named CAMS among America’s top high schools. CAMS will be replicated in East Long Beach starting next school year with an inaugural class of ninth graders at the new Sato Academy of Mathematics and Science. SAMS will be located at the Hill Classical Middle School site near Cal State Long Beach, where SAMS students will earn college credit while still in high school. The middle school at Hill is being phased out to make room for CAMS. Because CAMS regularly receives twice as many applicants as the school can accommodate, the program is being replicated to meet high demand among students and parents.